Virginia, home of FERIDIES, is not only known for great tasting Virginia peanuts, but also delicious country Virginia ham. 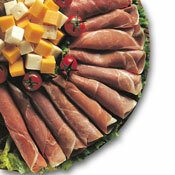 FERIDIES offers 3 options for Country Virginia Ham: 12-15lb Uncooked Country Cured Virginia Ham, 2-3lb Petite Boneless Cooked Virginia Ham, and 1lb Cooked Virginia Ham Slices. Great choices if you enjoy cooking/preparing your own or if you need something quick and easy. Today, Virginia Ham is enjoyed by people all over the country. People love to have it for family gatherings and celebrations such as Easter, Thanksgiving and Christmas. However, have you ever wondered about the history of Virginia Ham and how it came to be so popular? Before you dive into your Ham this year, take a moment to reach about the history behind it. 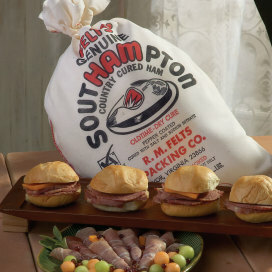 Virginia Ham has been around since Colonial America and has been popular since some time in the 1700's. During that time, settlers were shipping hams back to England as one of the first exports from the New World. When the settlers arrived in 1607, it is believed that hogs were brought on the ships so the settlers would have something to eat. They were not known to have been in this environment. They were kept on "Hog Island" which is now part of Surry County, Virginia. When the settlers needed food, they would go there and hunt some hogs to bring the meat back to Jamestown. They would cook the meat over the open fires and any meat that was not eaten within the first 12 hours of it being cooked was then preserved with salt. They would either keep the meat for themselves using this method or they would send it back to England. This method of curing country ham has been passed down for centuries but it has also been altered to create the Virginia Ham you know and love today. This story of how Virginia Ham came to be shows the rich history behind it and why it is such a staple in many of our gatherings to this day. Here at Feridies, we make sure we cure ham the right way so it tastes perfect no matter the occasion. It is a great addition to large gatherings or even for a small dinner party. Our Virginia Ham will be a hit and if you tell your guests the story of how it came to be, they may be even more impressed. Be sure to get your Ham today to make it the perfect day.